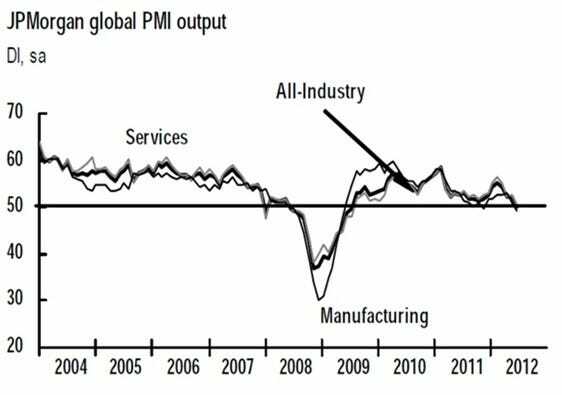 Mi sto trattenendo dal dire "Io ve l'avevo detto... che la partita era ancora tutta da giocarsi..."
.........As the chart below of global output suggests, I continue to believe that we have reached the point that delineates an expansion from a new recession. Earnings Season Begins, And It's Expected To Be A MassacreToday is the "unofficial" start to earnings season, as major aluminum player Alcoa will report after the bell. Obviously, the question on everyone's mind is: How bad has it gotten? Get ready for the end of record corporate profits says the Associated Press while Reuters is noting that the corporate outlook is the most negative in roughly four years. There is no denying Europe’s importance to the S&P 500.